Stars attend LA Golden Globes party Jump to media player Hollywood is preparing for the Golden Globe awards, and many British stars have been attending a tea party ahead of the main event. 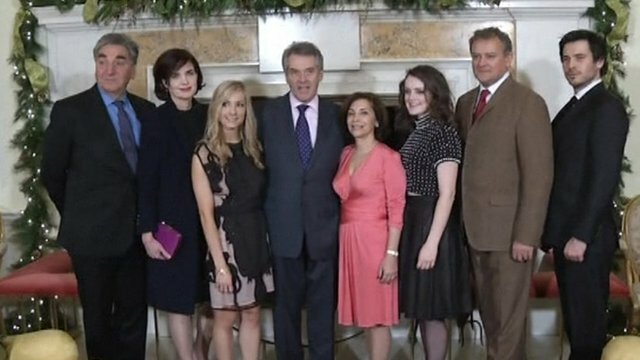 Downton stars on Golden Globe nods Jump to media player The cast of Downton Abbey have given their reaction to the programme's nominations for the 2013 Golden Globes. Hollywood is preparing for the Golden Globe awards, with the historical Steven Spielberg biopic Lincoln nominated for the largest number of awards. The Golden Globes are the first major awards to be given this year, and are seen as a more relaxed version of the Oscars.